This is more than a car, it's a four-wheeled illustration of the American Dream. If someone works hard, they can achieve their goals. And if someone wants their car painted Heineken metallic green-then adds blue, red and candy purple highlights-well, by golly, it's a free country. BK, 24, works hard, holding down two jobs in Charlotte, NC (restaurant manager/chef and grocery stock associate), toiling seven days a week. Full name Byung Kook Choi, BK always wanted an Acura RSX. It was his dream car while in junior high around 2002. After graduating, he went to a showroom and put money down and got this '03 RSX Type-S, stuffed with the K20A2 engine, pearl-white from the factory. "A couple of friends took me to a Honda meet, and that's when I started thinking about what I should modify on my car," says BK. "My first part was an AEM cold air intake-that's when I got hooked! " Before he got too involved with the engine, BK decided to augment the looks with a J's Racing Type S body kit. This consists of a front bumper, side skirts, a carbon fiber rear diffuser and a Type V carbon fiber hood. Further aerodynamic appendages include front canards with winglets, a front under panel, trunk lid and a GT rear wing-all fashioned from carbon fiber. 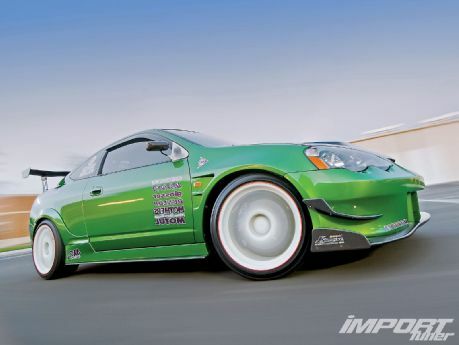 For a final aesthetic flourish, BK went for Ings wide fenders and lit the JDM DC5 headlights with Ignited HID 8,500K bulbs, then got the whole shebang painted in Heineken green. It was another friend who first suggested this hue. BK mulled it over for a couple of weeks then spoke to his paint guy, who assured him that it would look great. "I've never seen another RSX painted like it," says BK. It's doubtful anyone has. The next phase was all centered on the engine bay, so those sunglasses can come off now (but look out for those blue Samco Sport radiator hoses and the J's Racing blue anodized valve cover). The lure of forced induction was too great to resist, so while BK was in a GReddy state of mind, he sprang for a T517Z turbocharger, manifold and custom polished intercooler and pipes. He looked to HKS for its SSQV blow-off valve, to RBC for an intake manifold, and oversees the power delivery with a Turbo XS manual boost controller. A Hondata K-Pro ECU (tuned by RLZ Engineering of North Carolina) keeps another hand on the reins, choreographing a BDL fuel rail, RC 650cc/min injectors and NGK Iridium spark plugs for the internal combustion tango. With the dance in full swing, BK's engine now makes a claimed 298 hp at 7,800 rpm and 236 lb-ft of torque at a peaky 6,800 rpm. This is still with the stock compression ratio of 11:1. A well-regarded upgrade to Honda's K-series engines is the fitting of IPS K2 camshafts and valve springs, so BK wasn't about to fly in the face of conventional wisdom here. He also hooked up an HKS muffler, three-inch KTeller exhaust and piping, and a three-inch test pipe called . . . what was that name again? Ah yes, Unforgettable. Before we forget, BK added a Mishimoto aluminum radiator, removed the ABS, air conditioning and power steering apparatus, then did a full wire tuck. A project always reminds us that everything we do has consequences down the line. So more power requires a beefed-up transmission. In this case, an Exedy Stage 2 cerametallic clutch and flywheel do the business, along with a Buddy Club short shifter and custom chromed transmission brackets. BK gets the power to the pavement via a Quaife limited-slip differential and Driveshaft Shop Stage 1 axles. Phase three of the build focused on the suspension, with Tein Mono Flex adjustable coilovers gracing all four corners, augmented by Function7 billet lower control arms, Progress rear anti-roll bar and tie bars, plus Ingalls camber kits at the rear. Because it's easier to get a great setup on a rigid-bodied car than one flexing this way and that (this car is tuned to be road-friendly because BK drives to a lot of shows, even going as far as Toronto), BK installed a J's Racing strut brace up front, a Next Miracle X Bar out back and Cusco carbon fiber side bars. These helpful additions complement the main stiffening event: a Cusco six-point roll cage finished in classic Cusco blue, to go nicely with the green paint. This cage was originally made for the DC5 Type R, which doesn't have a sunroof, so there was a little cutting and welding needed to make it fit right. If BK gets excited every time he adds an aftermarket part, he must have been beside himself when he obtained a set of ten-spoke, 18-inch Volk CE28N Time Attack edition wheels, finished in white and with a +35mm offset. He shod them with Dunlop Direzza DZ101 235/40 rubber and bolted them (with Project Kics Neo Chro titanium lug nuts) in front of brake calipers that have been powder-coated in dark candy purple. "They used to be red," says BK, "but I wanted something different." Okay. Concentrating on the stopping hardware for a second, it's an Endless big brake kit with six-piston calipers and rotors out front, stock single-pot calipers and Powerslot rotors in the rear, Endless pads, and Endless stainless steel lines. By now, the car was crying out for a splash of red, so BK obliged with a set of red-stitched Bride GIAS2 Low Max Gradation front seats (note also the green Takata four-point harnesses) with matching trim for the rear seats, plus JDM DC5 Type R red carpets and door panels. JDM: these are three little letters BK took to heart. He converted the car to right-hand drive. "This was the toughest time," he says. The dash is an authentic JDM DC5 Type R model, complete with center console and shift boot. The pedals are from an Integra Type R; the steering wheel is a 350mm Personal Neo Grinta; heck, even the windshield is JDM (courtesy of Edmun Laurea from Opak Racing). Installed by BK's equally hard-working friend, Drew, are Defi boost, water temperature and oil pressure gauges, plus an AEM UEGO wideband air/fuel gauge. Also in the dash is an Alpine IVA-W200 head unit linked by Memphis Car Audio wiring to MCA amplifiers (set into a rack painted Cusco blue) and speakers. And for that ultimate touch of color, a blue titanium J's Racing shift knob.